Take equal quantities of sugar and cherries. 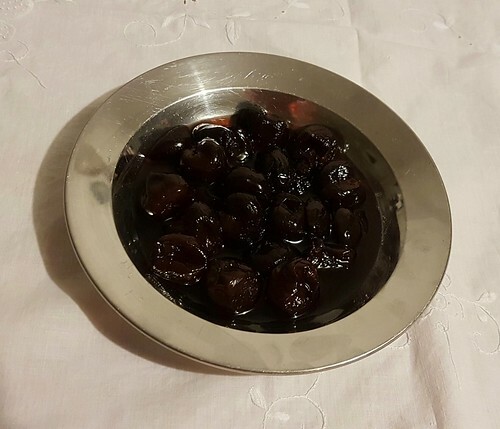 Put as much water to your sugar as will wet it, and boile it until it almost come to sugar again, then stone your cherries and put them in. To every pound of cherries put 3 spoonfuls of the juice of raspberries. Let them boil so fast that the syrup may boil up above the cherries until they are boiled enough, skimming off the scum as it rises. As soon as you take them off the fire put them into a dish of either silver or earth. There let them stand until they be almost cold then put them up. Put the sugar into a heavy bottomed saucepan and add just enough water to turn the sugar into a stiff paste; how much water will depend on how hot and humid the day is. Over a low heat, dissolve the sugar. Once the sugar has completely dissolved to syrup, stop stirring, and allow the syrup to reach 114ᵒ (soft ball stage). 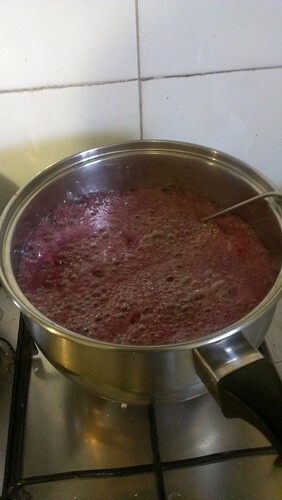 Put the cherries and raspberry juice in the syrup and return to the boil. Keep watching until the syrup boils up over the cherries, as described in Lady Fettiplace’s recipe. This is actually when the syrup gets to around 114ᵒ (soft ball stage) again. Allow to cool before serving or storing in a sealed, sterilised jar. Raspberry juice has quite a tart flavour, and it was probably added to cut through the extreme sweetness. However, it’s quite hard to get hold of proper raspberry juice unless you juice them yourself. Do not add raspberry cordial instead; it is too sweet and actually doesn’t taste of raspberry juice. If you can’t get hold of proper raspberry juice, use rosewater instead as a period appropriate substitute. Use good quality sugar to make this recipe. Cheap sugar can result in the syrup having an unpleasant, grainy texture. Feasts in the Tudor and Stuart periods ended with a banquet course, a gathering of the most favoured or important guests, where they were served a range of sugary confections. 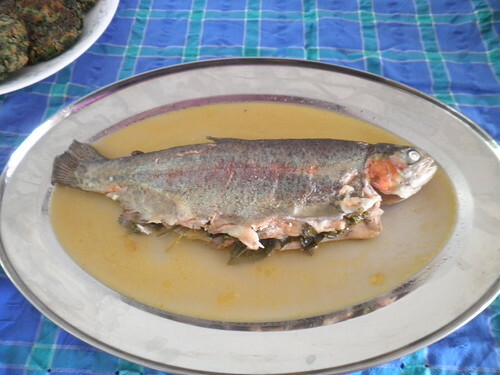 A dish like this would have been considered a wet sucket, and served in its syrup. The cherries would have been eaten by spearing them with the end of a spoon. How to butter a Colle-flowre. Take a ripe Colle-flowre and cut off the buddes, boyle them in milke with a little Mace while they be very tender, then poure them into a Cullender, and let the Milke runne cleane from them, then take a ladle full of Creame, being boyled with a little whole mace, putting to it a ladle-full of thicke butter, mingle them together with a little Sugar, dish up your flowres upon sippets, poure your butter and creame hot upon it strowing on a little slict Nutmeg and salt, and serve it hot to the table. John Murrell, A Booke of Cookerie, 1621. Take a ripe cauliflower and cut off the florets, boil them in milk with a little Mace until they are tender, then pour them into a colander, and let the milk run clean from them, then take a ladle full of cream, being boiled with a little whole mace, putting to it a ladle-full of thick butter, mingle them together with a little Sugar, dish up your florets upon sippets, pour your butter and cream hot upon it, strewing on a little sliced Nutmeg and salt, and serve it hot to the table. Although this is technically a seventeenth century recipe, the ingredients and methods were available in the sixteenth century, so this recipe would not be out of place at a late Elizabethan SCA feast. Cook until the cauliflower is soft, but still a bit crisp in the middle. DO NOT TAKE YOUR EYES OFF THE MILK OR IT WILL BOIL OVER AND MAKE A TERRIBLE MESS. To make the sauce, heat the cream, butter and sugar, stirring well to melt the butter and dissolve the sugar. Don’t let it boil, or the cream will curdle. DO NOT TAKE YOUR EYES OFF THE CREAM MIX OR IT WILL BOIL OVER AND MAKE A TERRIBLE MESS. 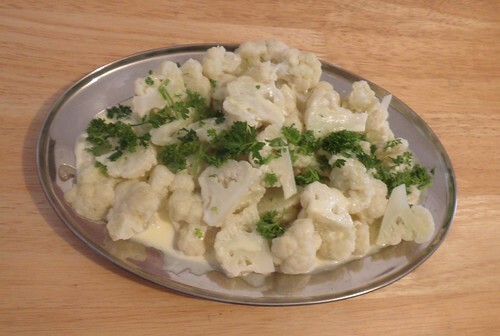 To serve, pour the sauce over the cauliflower, and sprinkle with nutmeg and salt. Cauliflowers were introduced to England in the late sixteenth century (Brears, 2016, 288), and would have been seen as a novelty. Brears, Peter. Cooking and Dining in Tudor and Early Stuart England. Totnes, 2016. 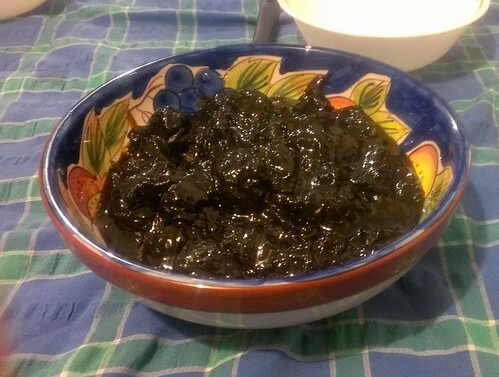 Take prunes, and put them in claret wine and sugar, as much as you think will make them pleasant. Let all these simmer together until the liquid looks like a syrup, and the prunes are swollen, and keep them in a vessel as you do green ginger. This recipe illustrates one of the great truisms of research – it often pays to track down the original to verify the facts. I first read this recipe in Peter Brears’ Tudor Cookery, which specified the recipe came from John Partridge’s 1573 Treasurie of Commodius Conceites and Hidden Secrets. This work contains many sweet recipes, and you can find a good transcript at David Myer’s Medieval Cookery site here. However, when I searched the transcript of Commodius Conceites for this recipe, I couldn’t find it; not only that, “syrup” was consistently spelled “syrope.” I even went to Early English Books Online to search the facsimile – I still couldn’t find the recipe. After a lot of searching, I finally found the recipe above – in a 1653 reprint, the text of which can be found here. Commodius Conceites went through several reprints and revisions(Holman, 2002, 2), and I would say the Prunes in Syrup recipe was added in one of these. This is a very easy, indulgent recipe, and the prunes in a pretty jar make an excellent gift. 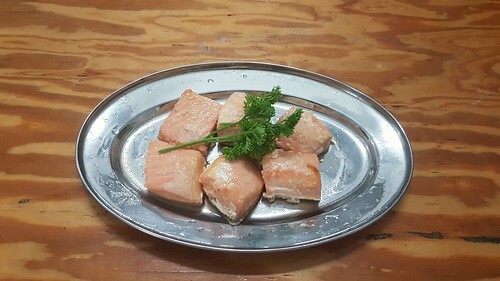 Although it is a recipe from a seventeenth century source, it would be fine to serve this at a SCA Elizabethan period feast. Soak the prunes overnight in the merlot so they rehydrate. Drain the prunes, reserving the merlot. Put the merlot and sugar in a pan and over a low heat, stir until the sugar is dissolved. Return the prunes to the pan and bring to a simmer. Cook until the liquid has thickened and reduced to the desired consistency. You can make the prunes ahead of time and store in a sealed, sterilised jar. They can be served hot or cold. I like to use wine made from merlot grapes as these are very close to the grapes used to make medieval claret. They are one of the oldest varieties (Shotman). Brears, Peter. Tudor Cookery. Swindon, 2002.